You might remember the teaser video we featured here on Geeky Gadgets that was released by the UK Gadget Show last week and revealed a few details of their amazing ultimate FPS gaming simulator. Well now the Gadget Show has unveiled all the details on how they went about constructing the amazing games simulator together with footage of it being played. 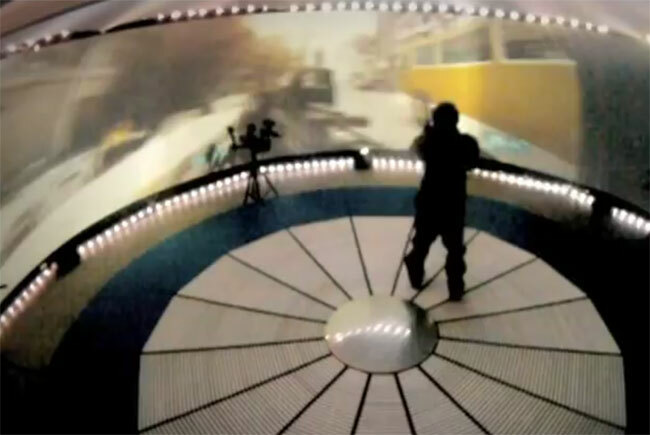 The gaming simulator incorporates the worlds first portable omni-directional treadmill designed by Swedish company MSE Weibull to provide a fully immersive feeling, and also projects the game inside a 360-degree, 4 metre high and 9 metre wide Igloo Vision video dome to make it feel as immersive as possible. Watch the 20 minute video after the jump to see it in action and what went in to building the simulator. Inside the dome there are also four gun turrets equipped with 3 paint ball guns each which provide a little motivation to not get hit as the fire paint balls to simulate enemy gun fire.